"The letter 'A' denotes Balaram , the son of Rohini, who is the substratum of the entire universe, who is the supersoul of the universe. The letter 'M' denotes Anirudha, who is the supersoul of each individual being in the universe. And the 'dot' above the 'M' denotes Sri Krishna, the fountain head of all Vishnu incarnations." "Rukminidevi, the Queen Consort of Sri Krishna is the Swarupa-shakti, the essential potency of Krishna and She is the Queen of the Divine World, Dwaraka/Vaikuntha. The Srutis which are closely associated with the narrations of the pastimes of the Vraja-gopis with Swayam-rupa Bhagavan Sri krishna, the Parabrahma, have declared this truth." The Gopal-tapani introduces us to the Vrindavana conception in verse 57 via the introduction of the swarupa-shakti as Rukmini. Srimati Rukmini is the swarupa-shakti or hladhini-shakti. In Dwaraka Srimati Radharani has appeared as Satyabhama and Chandravali has appeared as Rukmini. In Dwaraka-lila the higher position appears to be given to Chandravali as Rukmini but that is adjusted in that Chandravali, and thus Rukmini, is a prakash or expansion of Srimati Radharani. In verse 58 the Gopal-tapani establishes that both the prakriti, Srimati Radharani and Vishvanatha, Krishna the Creator, Sustainer and Destroyer of the universe are identical with AUM (OM). Of course the name of Radharani is not directly written in the verse but according to other sastra the mula-prakriti is Srimati Radharani. The higher subject is always hidden. It rarely directly shows Itself. Those who have the vision (rasikas) however, can see many hidden truths where others can not. "The wise and enlighten sages declare that the Swarupa-shakti of Bhagavan, Sri Radha, being the prime mula-prakriti is non-different from Om. Gopala, Sri Krishna who is the Creator, Sustainer, and Destroyer of the universe is also non-different from Om." From verse 55 to verse 58 there is a progression or development in conception. So, now we are only missing the jiva, correct? If we start from verse 58 and work it back to verse 55 still we don't locate the missing jiva. Or do we? There are different types of jivas. Ultimately they are all manifest from Krishna and can thus be said to be always present in AUM. That is a general statement. But there is deeper conception also. These different types of jivas which I mentioned are not simply the two categories which devotees generally acknowledge, namely liberated and conditioned. These two, liberated and conditioned jivas, are actually from the same category namely the tatastha-jiva. This tatastha-jiva is manifest from Maha Vishnu/Karana Vishnu and is either liberated or conditioned. The Vishnu manifestations are manifest from Baladeva Prabhu. From Sankarshan, a manifestation of Baladeva Prabhu also, the parsad-jivas, eternal associates of Narayana in Vaikuntha are manifest. These parsad-jivas of Vaikuntha constitutionally can not associate with Maya. They can never even be tested what to speak of fall down. Then from Baladeva Prabhu directly a categorically higher type of parshad-jiva are manifest to eternally serve the Lord at Goloka and Gokula respectively. This means the parsad such as Mother Yasoda, Nanda Baba etc. The parsad-jivas for the four rasas; vatsalya, sakhya, dasya, and santa are all manifest from Baladeva Prabhu. For the madhurya-rasa the madhurya-parsad-jivas are manifest from Srimati Radharani. There are hundreds, and hundreds, and hundreds, and hundreds, and hundreds, and hundreds of millions, of millions, of millions of these parsad-jivas in both Vaikuntha-rati (Love of God) and Vrindavana-rati (love of Krishna) who never associate with maya. The jiva of the tatastha only have a place in either Vaikuntha or Goloka when they have achieved the ashraya or shelter of an eternal servitor (parsad) of the Lord. Because Gopal-tapani contains the conception of Mahaprabhu it is accepted and valued by all Gaudiya Vaishnavas. In Mahaprabhu's conception there is always gradation. Not all one but gradation of everything; the jiva, the name, the devotee, everything. So in AUM there is also gradation. From AUM comes gayatri and there is gradation in conception of gayatri between the different sampradayas also. From gayatri manifest the Veda, the Vedanta, and Srimad Bhagavatam and there are gradations of conceptions there also. And after Bhagavatam there have been many rasa-sastra in different levels also. If someone has doubt then we should try to get them to see the ontological progression and then everything can be adjusted. But without qualification these matters are not possible to understand. The highest qualification for a fallen soul like myself is to have the shelter of higher Vaishnavas. I forgot to mention in our previous exchange that Jiva Goswami is the tattva acharya. Whatever truth/conceptions the Six Goswamis presented, Sri Jiva Goswami upheld with reference to the sastra. 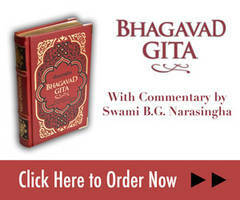 Everything has been presented with sastric references in the Sandarbhas by Jiva Goswami. I think that you are already aware of these facts.